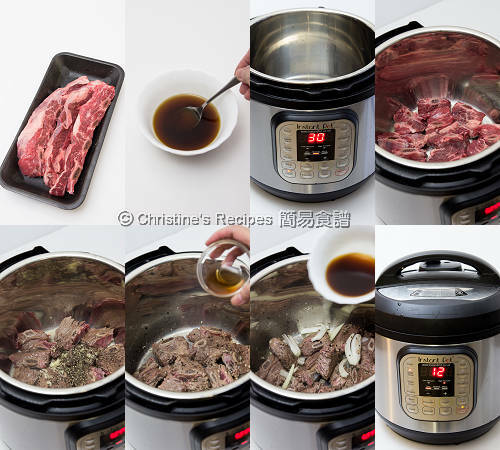 The beef short ribs are turned soft and tender very quickly in my Instant Pot. This recipe is a super-quick one suitable for pressure cooking if you have one. I got these beef ribs from supermarket that were quite thickly cut. I also inserted stovetop instructions in notes section below the recipe. Yet, my Instant Pot turned them into soft and tender meat just in a few minutes. This was our dinner dish I made after coming back home late from an afternoon gathering. The pressure cooker is really a good helper on such a hectic day. What I need to do was to pop in all ingredients inside the pot. After a few minutes, we enjoyed this flavoursome dish comfortably. What a bliss! Last black Friday, my instant pot was on big sale on Amazon. Did you manage to grab one to make some fast and delicious foods? 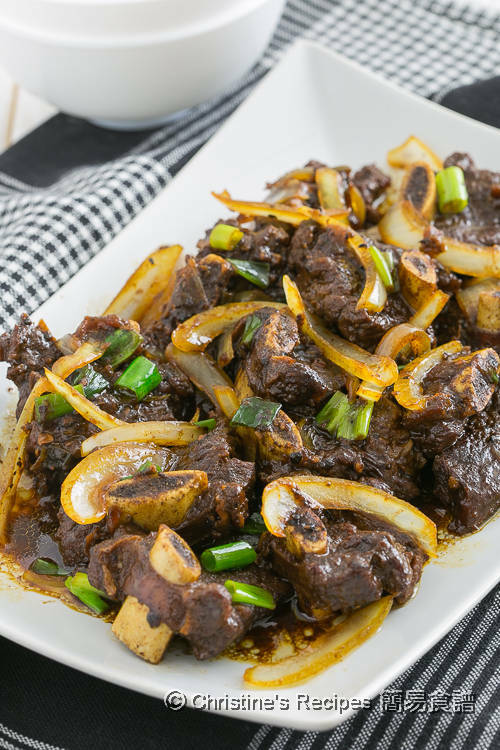 Cut the short ribs into chunks in 5-cm / 2-inch length. Mix all the ingredients of sauce. Set aside. Prepare your Instant Pot. Press the “saute” button and heat oil. Add the short ribs. Briefly cook until both sides are lightly brown. Stir in the garlic and black pepper. Sprinkle wine. Add half of the shredded onion. Pour in the sauce. Cover with “sealing” on. Press the “Meat/Stew” button. Set 12-minutes cooking time on high pressure. Quick release. When the float valve drops to the down position, remove the cover. Add the remaining onion. Press “saute” to cook until the sauce reduces by 1/3. Sprinkle spring onion. Serve hot. The coarsely ground black peppercorns are not very hot, just for enhancing the fragrance. I grounded the whole black peppercorns in a mortar and pestle. The ready-made bottled one from supermarkets can be used for convenience though. 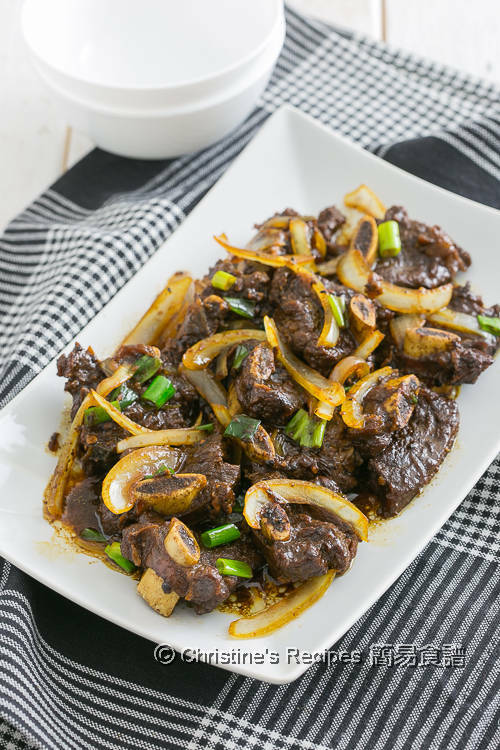 Short ribs are available at Asian butcher, Korean shops or supermarket. For stovetop cooking, add one cup of stock and cook on medium-low heat for 20 to 30 minutes. Replenish hot water if needed along the way of cooking. Easy peasy...I love this fuss free and delicious beef recipe! My family was really hooked up with this dish. Christine, I would love to purchase your new cookbook through Amazon, but Amazon.com (US) lists it for $51.00??? It is not listed on Amazon.ca (Canada). Will check with your Chinese publisher. Thank you. Thanks for your interest in my cookbooks. Yeah, it's better to check with my publisher. They take orders online from their site and deliver to anywhere in the world. I bought the instant pot from Amazon UK! Wonderful, Serene! Did you get the bargain price? my boyfriend got the instat pot from amazon during the deal too! i can't wait to try this recipe!! So sweet, your boyfriend. Must make him some delicious dishes with your instant pot. He'll like them. I bought the instant pot recently and tried few of your recipes. How does the pressure release work? Sometimes I feel like it's not doing anything so I use a chopstick and try to release the pressure myself. There are two methods of releasing the pressure inside. One is to let the cooker cool down itself, called natural release. It takes ten minutes to 15 minutes, depending on the quantity of food you cook. The other one is to turn the handle to the position of "venting" immediately after cooking. Just like that you can use a chopstick to turn the handle yourself. You can refer to your user manual for details. Hi Christine, I picked up my new toy last week but haven't opened it yet but soon, to test out your recipe. Was wondering whether you meant to cut the beef in 2 inches length rather than 2 cm? Thanks for asking. Yes, it's a typo. It should be 2 inches length. I updated the recipe. You'll like your new kitchen toy. Happy cooking! Hi Christine, I cant seem to buy the instant pot from Amazon, it says they cant ship that to Australia. Amazon has to change their policy. It's no good for us online shoppers.